This scary fox has just left the house to go on a walk with his daddy. I'm hoping he doesn't scare the neighbors. 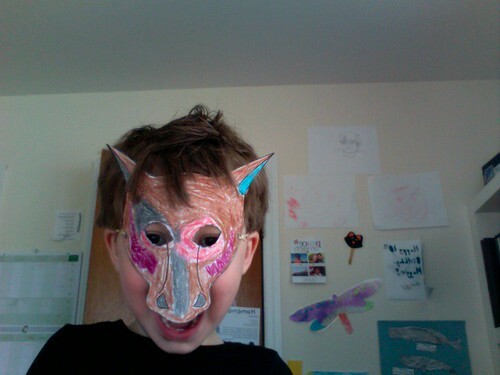 My Mom sent me the link for the site where I found this mask. Momes.net is in French so will probably be a bit awkward to navigate if you don't speak the language, but if you'd like to learn some of the songs I sang as a child you'll have to check out this section. Tor and I colored in the print-out, and then glued it to some sturdier craft paper because I could tell the thing would fall apart in minutes without some reinforcement (you can't tell from this angle, but it is a lovely, contrasting Teal to match the front of the mask). Next, I cut it out & attached a long rubber band to secure it to his head. Voila! We have a very scary little boy fox who did an excellent job of frightening his Dad.